Get a Tamil Astrology reading from our expert for 2014 - 15! 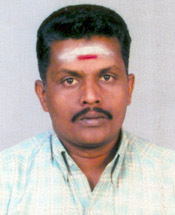 Thiru. Dhaneskudi, our Tamil Jyotish, hails from the spiritual city of Madurai in Tamil Nadu. Our Tamil astrologer uses his deep knowledge of Vedic Astrology (Ancient Indian Astrology or Hindu Astrology) to predict your future and also conducts pooja and prayer on your behalf for your well being and the well being of your loved ones. Out Atrologer's predictions and remedies are tried out through generations as his forefathers too were in the same profession. In case you already have your astro chart ready, please get in touch with our Tamil Astrologer over phone at 8939047533.